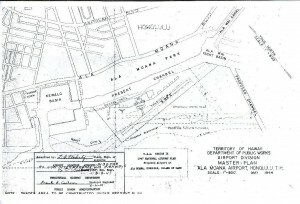 In 1944 the Territorial Department of Public Works proposed that an airport for private flying be created by a combined coral dredging and fill project on the reef between downtown Honolulu and the Waikiki section of the city. Such an airport was proposed in the planning report submitted to the 1945 session of the Legislature by the Territorial Post War Planning Advisory Board. The project was to be located on tide lands approximately 1,000 feet south of Ala Moana Park, 1.5 miles from the Honolulu Post Office and six miles from the existing John Rodgers Airport. The proposal included construction of a dredged coral fill approximately 3,000 feet by 1,000 feet to elevation plus 76.0; construction of 4,000 feet of rock seawall; an oiled runway 3,000 feet by 500 feet, with a paved strip 2,500 feet by 100 feet; erection of hangars as necessary; topsoil, seeding and landscaping and necessary lighting. The development was solely in the interests of beginners and private owners and was not to be used for commercial flying, other than student training or charter flights. The site could be enlarged at a nominal cost into a field with two 4,000 foot runways capable of taking any two engine ship such as were now being used by Hawaiian Airlines. A further extension to 5,000 foot runways could be made if and when John Rodgers Airport became overcrowded and additional landing facilities for four engine plans was required. The CAA was considering applications from six or more airlines, both domestic and foreign, for trans-Pacific service, also applications from several mainland commercial airlines for service to and from Honolulu. They concluded that there would be a large number of heavy luxury planes and heavy freighters landing and taking off from John Rodgers. It was also anticipated that the airlines would protest and exert all possible pressure to force student and private flying off the airport. Small planes were a definite hazard in this case, and it “is the opinion of the DPW Airport division that the Territory will be forced by economic considerations and by pressure from various interests to make such a ruling,” the Superintendent of Public Works reported. The DPW completed preliminary plans and estimates, and indicated that it could complete final plans within 60 days after an appropriation was made. The estimate for construction of ground facilities was $290,000 and $25,000 for buildings. The CAA was expected to fund the ground construction costs and the Territory the buildings cost. A request for the funds was sent to the 1945 Legislature but no appropriation was made. The entire subject of private flying on Oahu was discussed in the “Kipapa Field” section of this report. It was recommended that the Kipapa, Haleiwa, Kahuku and Bellows Army Fields be utilized for private flying purposes and that the Ala Moana Project be carried out at an appropriate time in the future. The Ala Moana site, according to the DPW, was satisfactory from an aeronautical point of view and construction considerations. The cost of the project would be relatively low and the success of the airport as a private flying center would be assured from the start. The project is favored by the most responsible established flying schools and aviation interests. Although the proposed airport was included in the Planning Board Report, the project received no recognition from the Legislature. 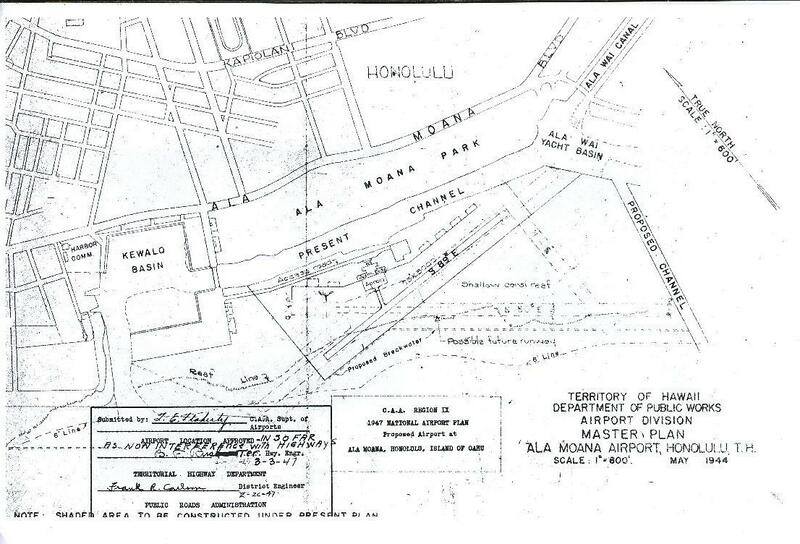 A Master Plan for Ala Moana Airport was approved by the CAA Region IX as part of the 1947 National Airport Plan as submitted by the DPW on March 3, 1947. The runway was located makai of Ala Moana Park and consisted of a single runway 3000 feet by 75 feet.